Open webpages, multiple windows and screens replace piles of library books for recommended readings. Distracted clicking consumption of information through variety of sources (articles, blogs, video), links, and tags impeded my progress this week. Cognitive overload anyone? This week 2: Inquire (#oldsmooc) introduced the importance of understanding learner context to inform learning design. 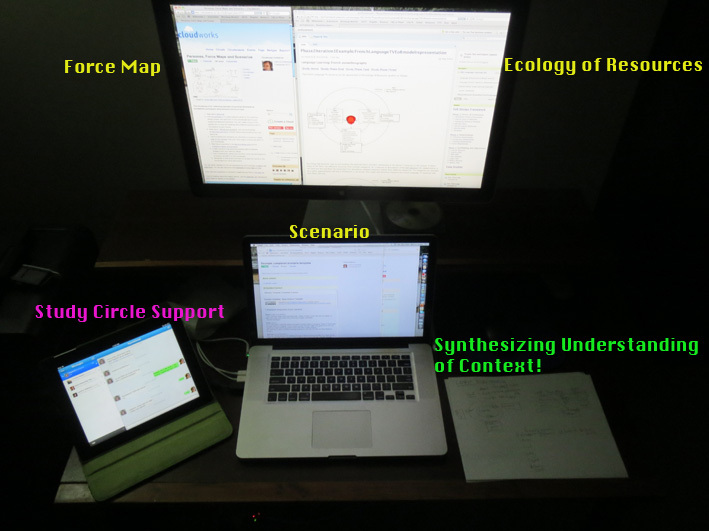 Several tools: Scenario Based Design, Force Maps and personas, Ecology of Resources, and Lattice Model (left out of the activities) were introduced as mechanisms to help learning designers connect to the motivations and goals of anticipated participants. The purpose of these models is to help learning designers make decisions about course content, activities, tasks, and tools. Each model ‘inquires’ the learner from different angles and subsequently evokes a different response from the reader, in this case, me. Below, I have attempted to capture my ’emotional’ responses to each of the models in an attempt to understand how I might use them within my own work context. Scenario Based Design: The Scenario Narrative feels like reading a character and plot summary. Scenario writers (for example Koutropoulos, Bozic Grojic , Gregoire) wove a story about their characters that captured my attention immediately. The focus on the character and their learning challenge/goal immediately drew me into wanting to find a solution. I found myself remembering these protagonists long after reading the descriptions. This may be beneficial for a learning designer who needs to deeply explore the context of the learner. A narrative gives the designer an opportunity to walk a mile in that actor’s shoes. However, these scenarios can become quite long and more than a few actors can be overwhelmingly time consuming to write. I wonder could the learning designer feel too connected to the characters? Perhaps loose objectivity? Is objectivity a goal for learning designers? Would creativity take over and characters become more fiction than reality? Also, this model, feels quite linear and set in a very specific place in time. Force Maps: The product at the end of a Force Map brainstorm feel similar to doodles created on coffee shop serviettes while talking with colleagues. The force map approach is ideally suited for these informal coffee chats that are often the most invigorating, stimulating and productive conversations of the day. The force map activity moves designers through a process of identifying anticipated personas (the who), the learning aims or objectives (the what? ), the material, social and intentional factors between the learner and their achievements and finally identifying the forces between those items that positively or negatively affect learner engagement. For those of us that are often pressed for time, this tool, is a quick way to start the conversation and help identify barriers for consideration in the planning of the course. The force map visually captures systemic forces that impact learner agency. The movement of lines, positive and negative slashes across the map suggests movement and a dynamic environment. Ecology of Resources (EoR): This was the most structured and formal framework to think about learner context. Because this model visible puts the learner at the centre, I immediately identified this model as suited for my current organizational context and our emphasis on learner-centred approaches. Also, I had until this point thought that cultural context was missing from the dialogue of learner context; however, Luckin speaks to the importance of cultural context in Redesigning Learning Context Technology rich, learner-centred ecologies; the EoR framework is also influenced by Vygotsky’s sociocultural approach. EoR is a model that I would like to explore further, unfortunately only the first 30 pages were available online (and I am bound by time restrictions for seeking out further readings). Specifically I would like to explore the influence of technology in the learner ecology. The EoR models asks the learning designer to discover a learner’s context by moving though a series of three phases and steps: 1) Forms of Assistance, 2) Relationships, and 3) Scaffolding and Adjustment; these are best summarized on the EOR Model and Design Framework Wiki. Again because the organization I work for teaches language online, I was drawn to the Case Study of Language Learning. In this case study the participant is autoethnographer and painstakingly documents through blogs and time dockets the learner context through the 1) knowledge and skills the learner brings to their learning, 2) the tools and people that are available to the learner and 3) the environment that the learner is navigating. I have not yet applied this model to my own context, but is an exercise that I think will provide insight into our current design choices and provide considerations for future changes. Points to Ponder: Also, this week I wondered if the context of gender is to passé for discussion? Was there a suggested reading that I missed? What are the assumptions if we no longer consider these differences? In the oldsmooc videos, there seems to be a bias to describing the personas as male characters (but to be fair I did not do a word count and the videos are only a glimpse of the whole process). This lead me down the mental wandering of learning designer bias? What assumptions do learning designers make because of their own contexts? How does this bias affect design decisions? The task of a learning designer is part scientific endeavour and artistic creation. Context seems an illusive concept: mysterious in the scenario based design, tumultuous in the force map visualization and evolving in the EoR model.